Mystery Series' Portly P.I. Peels Back The Layers Of Delhi Society Tarquin Hall's mystery novels, starring the Punjabi detective Vish Puri, are a merry introduction to India's cultural and culinary delights. 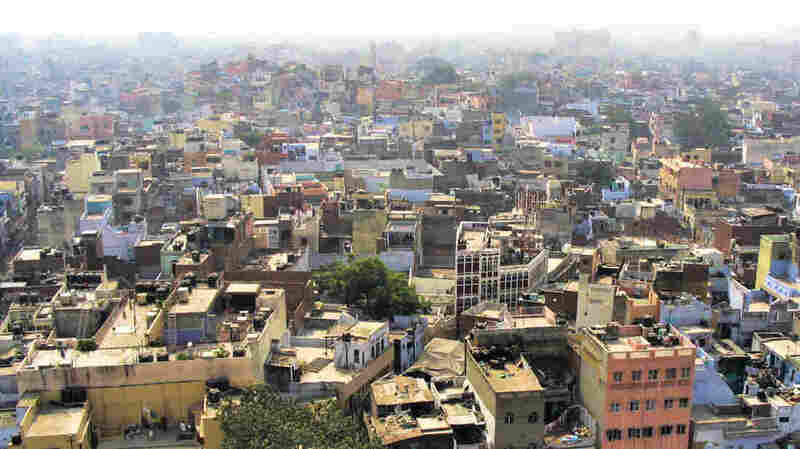 Delhi, India's second-most-populous city, is home to over 16 million people. It's a metropolitan region that includes the capital, New Delhi, as well as other nearby cities. 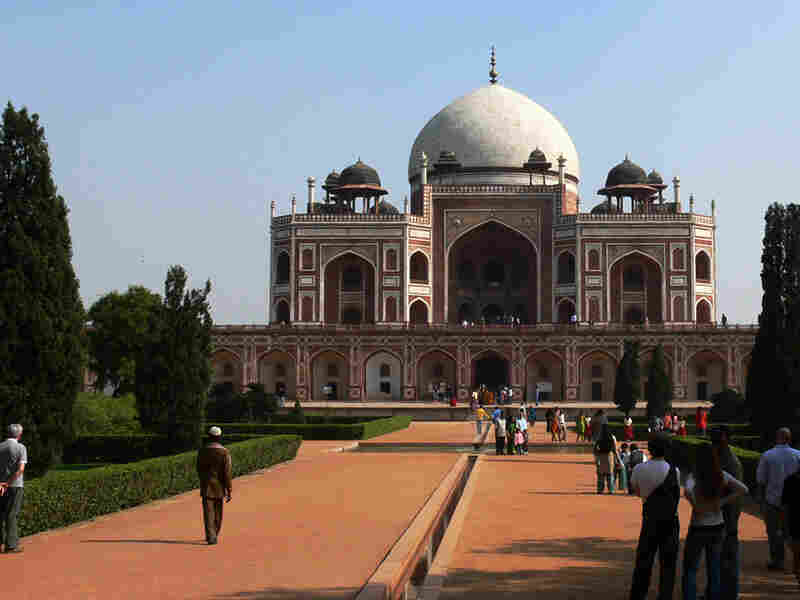 For an introduction to India's cultural and culinary delights, you might hop a flight to Delhi or book a trip to Mumbai. But to meet the country sans passport free of airport indignities, you could just curl up with the crime novels of Tarquin Hall. Vish Puri, Hall's opinionated private investigator, is a 50-something Punjabi super sleuth with a fondness for family and food. The mustachioed detective cracks open India's underbelly with a caseload that delves into forbidden love, corruption in Indian cricket and the deadly clash between science and superstition. 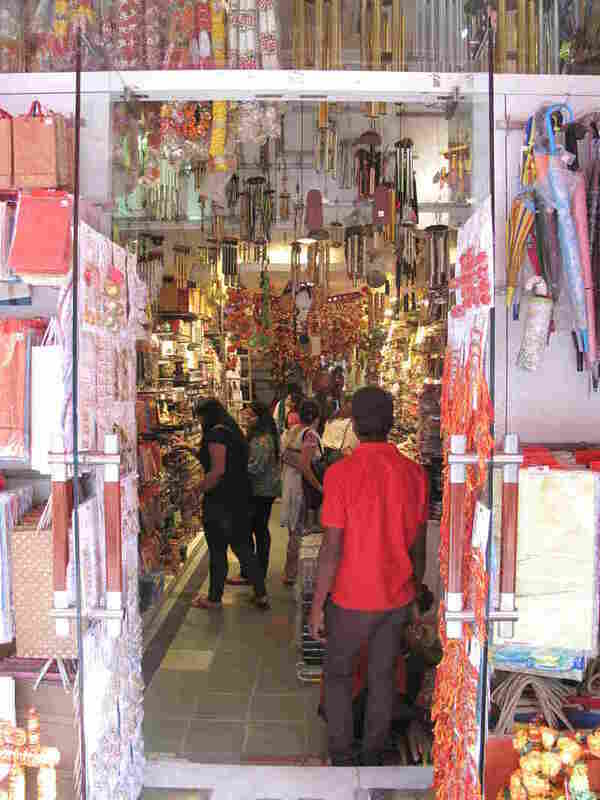 Puri hangs his shingle in the upscale Khan Market in New Delhi, near the posh residential compounds for senior government officials, their "Lutyens bungalows" a relic of the British Raj. Standing in the market, Hall explains why he chose to set Puri's office in this high-priced district. "It's a great place to describe, because you have seen so much change here. It was a very sleepy little market in the mid '90s when I first lived in India," he says. "You've now got this amazing bling: you've got shampoo from Provence, you've got cookies that sell for twice what the average Indian laborer makes per day." "And yet you've still got all these little stores squeezed into the nooks and crannies. You've got all these wires hanging everywhere, you've got drains opening up, you've got street dogs. So to me, it's really the perfect place to describe India today." 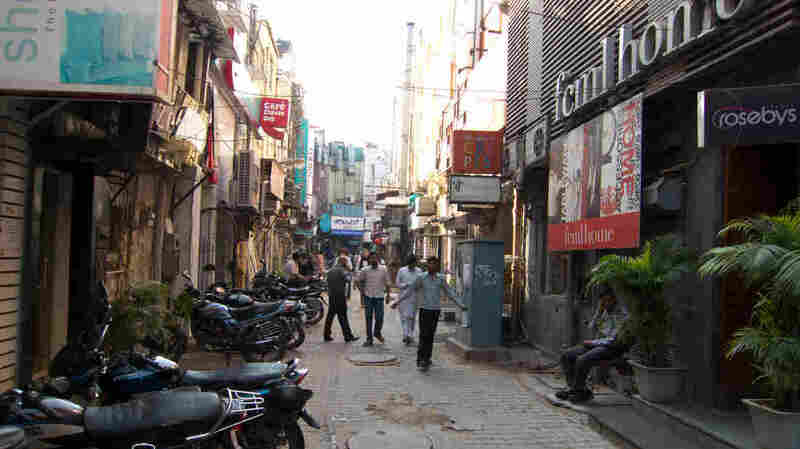 Khan Market is an upscale shopping district in Delhi. The wide streets are filled with luxury cars, and motorcycles line the narrower alleys. Vish Puri inhabits a world of unsavory characters, his creator has a taste for adventure, too. In 1989, at the age of 19, Hall left home in North London to report on the tumultuous events in Afghanistan. He's since lived in Pakistan, Kenya and Turkey, and reported from around the world. Now, Hall uses his journalist's eye to sweep his readers along as Vish Puri journeys through India. His sleuth hops on trains to uranium mines, crosses the border into rival Pakistan, and speeds to Rajasthan in his chauffeur-driven Ambassador car — a symbol of Old India that indulges Puri's sense of nostalgia. Tarquin Hall, shown here near the Rajpath in Delhi, is a British-born journalist and author. The Case of the Missing Servant, the first book in the Vish Puri series, was his first mystery novel. In The Case of the Missing Servant, Hall's first book, he vividly sets the scene in a bazaar in Jaipur: "[Puri's driver] honked his way through the light traffic as they neared the Ajmeri Gate, watching the faces that passed by his window: skinny bicycle rickshaw drivers straining against the weight of fat aunties; wild eyed Rajasthani men with long handlebar mustaches and sun-baked faces almost as bright as their turbans. " "One of the great joys as a writer here is that you really don't have to look far for material or color," he says. "You just come across it at every turn." 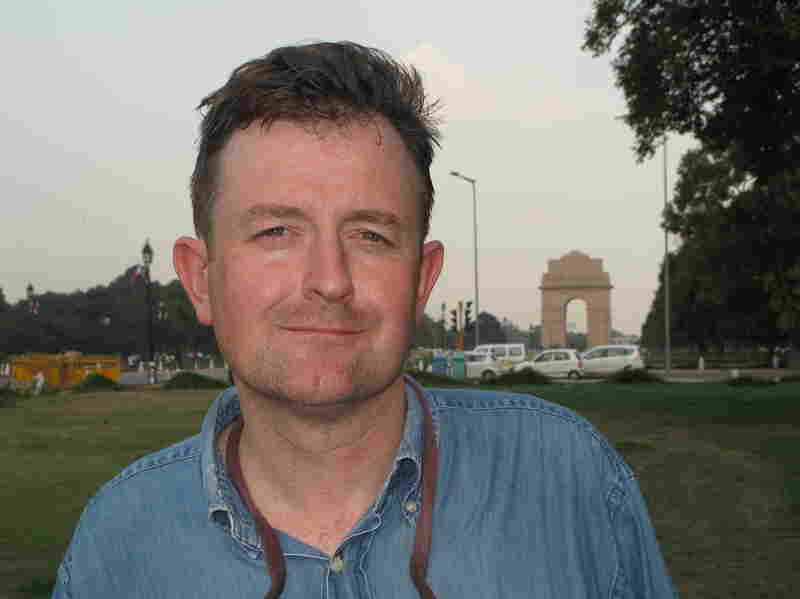 Hall is a white Englishman trying to get under the skin of India and peel back the complexities of Indian culture. To the uninitiated, that culture might seem like anarchy, but from seeming chaos Hall gleans the intricate systems that actually govern India. For instance, The Case of the Deadly Butter Chicken, Hall's third book, provides a glimpse into the hidden world of couriers who transport most of the world's diamonds in and out of the Indian state of Gujarat. "Diamonds arrive in uncut, unpolished raw stones in Mumbai, or Bombay, and they're taken to Gujarat in Western India — mostly to the city of Surat. There they're cut, polished and they're sent back," Hall explains. "DHL, Federal Express, UPS doesn't get a look in. The entire supply is carried by little men and women, children, God knows who — up their trouser legs, in the bottom of their Nivea cream pots. None of it goes missing. And they're kind of the envy of the world, really — nothing else works like that." Humayan's Tomb, a 16th-century Mughal garden tomb that helped inspire the Taj Mahal, is one of several UNESCO World Heritage sites in Delhi. In the land of IT, the Indian private eye wonders to himself what cookies have to do with computers. Food is never far from Puri's mind and the savory smells of Indian delicacies rise from the pages of Hall's books in which his sleuth grazes at the buffet of Delhi's fabled Gymkhana Club and devours pakoras and other spicy street snacks during stake-outs. Fastidious to a fault, Puri leaves no incriminating evidence lest wife Rumpi discovers he's off the diet – again. "He's a foodie! He's a Punjabi guy. He loves his food," Hall laughs. "Turmeric stains; you don't want to get any turmeric on you. It's a dead give-away. You get it on your fingertips, you get it on your shirt, so he eats with almost forensic precision." Hall decided to use a detective to tell the story of modern India after trailing real-life private investigators. He was struck at how deftly they read their complex society, and Vish Puri was born. Through Puri, who usually outwits the police, Hall weaves into his work the abiding suspicion many Indians have about the police. "If you don't have any standing in Indian society, if you don't have contacts, if you don't have wealth you are essentially at the mercy of a system whereby there is a very, very tentative rule of law," Hall says, explaining why the police make him angry. "Trying to get justice is very, very hard," he says. "Now, I love India, I love the culture, I love being here; it's where I met my wife, it's where I'm raising my children. But you need justice. It's fundamental to any society." 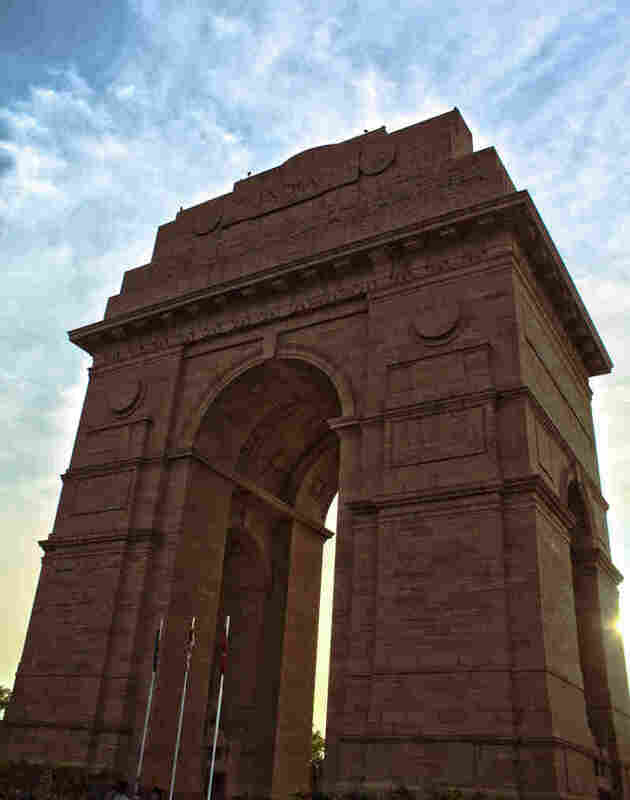 The India Gate, designed by Sir Edwin Lutyens, stands at one end of the Rajpath in New Delhi. Hall's novel The Case of the Man Who Died Laughing has an eerie real-life twist. That book features a murder in Rajpath, the physical center of New Delhi as well as its center of power. "We're standing almost on the spot where I envisaged the murder happening, this big lawn in the middle of British New Delhi," Hall says. "The character who is murdered is a rationalist, is a scientist who's dedicated his life to trying to eradicate superstitious thinking." Hall's fiction foreshadowed fact: Just last week a renowned doctor who had led a crusade for science and against superstition was shot dead while on his morning walk in the city of Pune. Dr. Narendra Dabholkar, 65, was a well-known anti-superstition activist and vocal critic of sorcerers who claim miraculous powers and used superstition to extort money from followers. But in a land of gurus and godman, reformers like the slain doctor provoke their enemies by unmasking their so-called miracles. Hall says rationalists debunk them by mastering tricks such as walking over hot coals and demonstrating to the public just how it's done. Essentially, Halls says, "they beat them at their own game." While this was a case of life imitating art, Hall's upcoming Vish Puri novel, The Case of the Love Commandos, is art based on life; the Love Commandos are a real group that helps couples seeking to make "love matches." Tarquin Hall has hurled himself into the maw of India with the same gumption that drove him to Afghanistan in his teens. The measure of his literary success here could be the Indian woman who overheard us discussing his who dunnits. She couldn't wait to tell him that he nailed the life and lingo of Northern India.